The 2018 Cycling Australia Masters Track National Championships got underway on Wednesday with 32 finals contested in the time trial, scratch and team sprint at the Darebin International Sports Centre Velodrome in Melbourne. Three-time trial national records were broken with Darrell Wheeler (Dubbo CC) in the Men’s 9 Time Trial, Sally McKenna (Hunter Valley Masters) in the Women’s 5 Time Trial and Elizabeth Randall (Blackburn CC) in the Women’s 8/9 Time Trial. Wheeler and McKenna, in addition to Simone Grounds (Dubbo CC), Aaron Bonser (Track Cycling WA) and Gary Mandy (Illawarra CC)celebrated dual wins on the day. The Championships run Wednesday 28 February to Saturday 3 March. 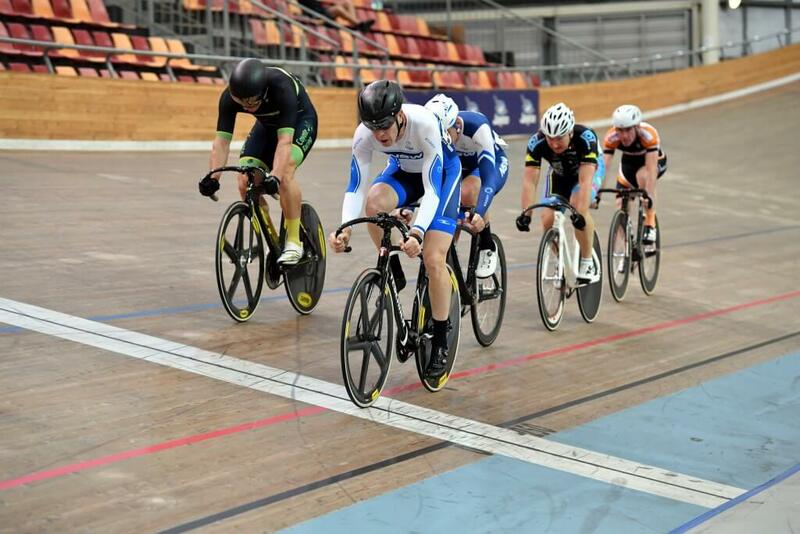 The 2018 Cycling Australia Masters Track National Championships continued on Thursday with 17 finals contested in the pursuit and sprint events at the Darebin International Sports Centre Velodrome in Melbourne. Four national records were broken through Victoria’s David Moreland (Bendigo & Districts CC) in the men’s 7 individual pursuit (2:26.810) and Rhianon Norton (Shepparton CC) who was just outside the world record with her time of 2mins 31.870secs in the women’s 1 pursuit. Queensland’s Andrew Patten (Hamilton Wheelers CC) set a national record of 2mins 18.301secs in the men’s 5 individual pursuit, while teammate Cam Campling (Brisbane CC) set and All-Comers record and national record of 10.867secs in men’s 2 sprint qualifying. Two World Best Times highlighted day three of the 2018 Cycling Australia Masters Track National Championships on Friday which included 17 finals in the pursuit and sprint events at the Darebin International Sports Centre Velodrome in Melbourne. The day kicked off in the best way possible with a World Best Time (3:22.480) posted by Brad Norton (Shepparton CC) in the very first heat of the day in the men’s 1 individual pursuit. Sally McKenna (Hunter Valley Masters CC) clocked a World Best Time of 12.074secs in the women’s 5 sprint qualifying. In the men’s 9 sprint, Hunter Valley Masters’ Rod Price (12.865) smashed the national record (13.056), however just four minutes later, John Dixon (Track Cycling WA) eclipsed this time to set a new benchmark with 12.795secs. Three team pursuit Australian records wrapped up the 2018 Cycling Australia Masters Track National Championships in Melbourne. The New South Wales Team of David Willmott (Randwick Botany CC), Gary Mandy (Illawarra CC), Matthew Glanville (RBCC) and Gavin White (Randwick Botany CC) set an Australian record (2.12.704) in the Mens 150+. The Dubbo G Force trio of Heather Ticehurst (Dubbo Cycle Club), Simone Grounds (Dubbo Cycle Club) and Jennifer Raines (Dubbo Cycle Club) set an Australian Record (2.34.061) in the Women All Ages. In the Women 140+, Anna Whitten (Hunter Valley Masters), Sally McKenna (Hunter Valley Masters) and Sherrie-Ann Prossalentis (Hunter Valley Masters) clocked (2.34.650) to set the third record of the day.